Dear Friends, you are invited to celebrate the 10-year anniversary of the S2000 Boston Mountains Tour!! This anniversary tour will cover some of the best winding and scenic roads that Southern Missouri and the Boston Mountains range of Northwest Arkansas have to offer. These roads can offer a challenge to even the most experienced drivers. On Saturday, October 29th, all drivers will be given a tour packet that will have your group number, route with turn-by-turn directions, lunch and dinner maps (if applicable). 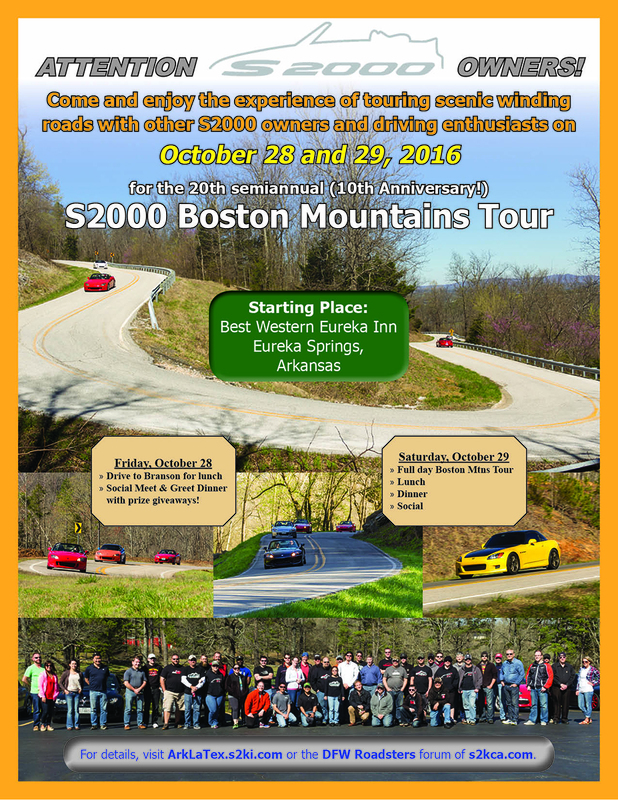 The Arkansas Boston Mountains Tour is one of the best environments for you to fully enjoy what your sports car was made to do, TURN! The BMT is a great social event; in addition to the excitement of the drive, you will have the opportunity to meet great people from across multiple states. We look forward to seeing you there! Friday, October 28 is the addition of a lunch meet in Branson, MO, followed by a scenic drive to Eureka Springs, AR where we will have a dinner/social event on Friday evening with a raffle drawing for prizes. On Saturday, October 29, we will start the all-day Boston Mountains Tour from the Best Western Eureka Inn in our typical fashion for those of you that have joined us in the past. Thank you for 10 years of unforgettable friendship and memories. ***For out-of-towners and those staying in Eureka Springs, AR Thursday night, I will be leading the group to the Branson Lunch on Friday so no need to worry with directions if you're coming with me. Mandatory Drivers Meeting: 7:45 a.m.
Group Rate name: "S2000 Boston Mountains Tour"
We have a group rate of $101.95/Night for 2 queen bed room AND INCLUDES full breakfast buffet. Those from out of town, don't forget to make your reservations for 2 or 3 nights (depending on if you're attending the Friday events) since we are ending the Tour Saturday back in Eureka Springs. Reminders will be given periodically as we get closer to the event to inspect your: Car, Tires, Fluids, Brakes. Also be sure to arrive to the starting point with a full tank of gas. CONTINUE TO CHECK THIS THREAD FOR PERIODIC UPDATES. zbillster (Bill) attending both days Welcome back!! JimmiJ (Jim & Connie) attending both days welcome back!! hondawifey & Kev will be there for both days events! From the Lone Star State, of course! JHarris405 (Justin Harris) from Oklahoma will be there for BOTH days. Tentative but 80% possibility for my attendance. James +1. Saturday only. Must try my best to attend dinner that night just to get to know y'all more. Eureka is not too far from Fay. Will be there Saturday, hotel reservations made +1 Missouri. Plan on making Friday, see what work says. Maddy and I will be there for the Saturday. I'll be there for both days, will have a +1 on Saturday. Jim and Connie will be there for both days. Who do we order shirts from. We are coming from Florida. Keon Lawrence. Coming from Oklahoma. Will be attending both days. No passenger. EDIT: Will be attending both days instead of just Saturday.